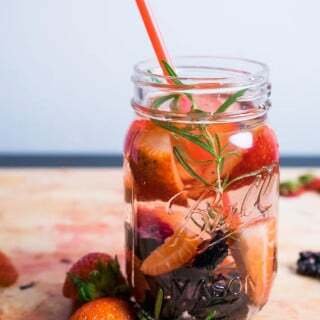 Strawberry, Blackberry and Rosemary Infused Water. A flavor combination that works deliciously well. We couldn’t stop drinking this one! So, it barely lasted 24 hours in our fridge. 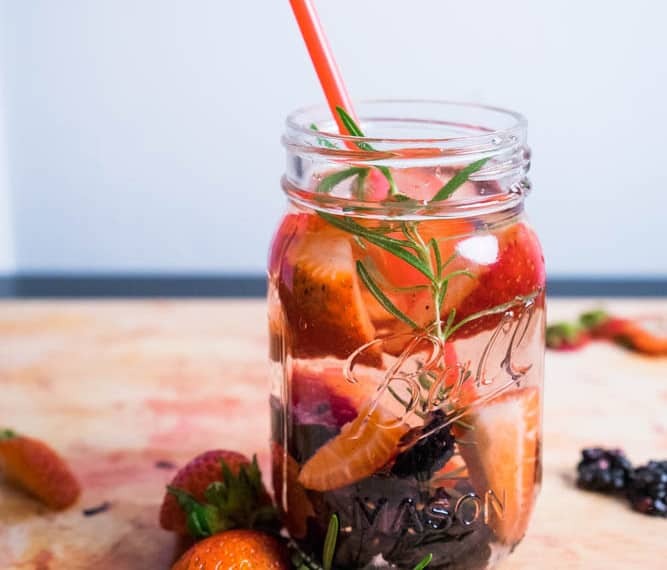 I love fruit infused water and this one is definitely my favorite. So far! Strawberries are the easiest fruit for infused waters. It not only gives a good strong flavor, but also tints the water a lovely pink color. Mmm! Cody and I have decided to add biking to our weekdays, instead of just walking. We are pretty tired by the time we get back home. Trust me. There’s nothing better than coming home from walking or biking and gulping down a glass of this. I’m serious. It’s amazingly refreshing. We’ve been using a website called foodpairing.com to help us create interesting flavor combinations. That’s what lead us the addition of rosemary to this water. As always. Toss all the fruits into the water. Aaand enjoy!